Each measures 2" x 5/8"
Soft, flexible eraser with beveled ends erases cleanly every time. 2" x 5/8". 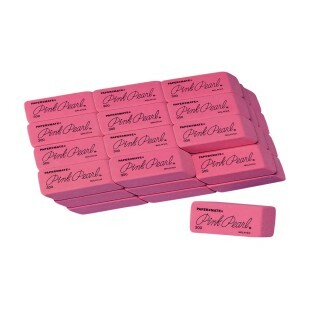 Pink Pearl Erasers- Love em' !!!!!!! I LOVE these erasers. If I could give them a 10 I would. GREAT quality product!! At my sleep-away camp we used lots of these erasers when sketching out stage sets of Color War shields.